Sometimes I imagine what BOC would have been like had we all been here, and the internet in place, back in the good old days of the 1990s. Today’s On This Day takes us back to 25th November 1990. I recall it because I had had a great night out in the locality with a good mate, and we decided to go back to my house to watch the Test Match. It was the first test of the Ashes, at Brisbane, and the game was very evenly poised. What followed was symptomatic of the next decade and a half. England collapsed in a total heap for 114, and Australia knocked off the 157 runs needed for no loss. The destroyer was a familiar foe. Terry Bloody Alderman. 6 for 47. Me and my mate crashed out, and as I drove him back home the following day, we could do nothing but shake our heads at this woeful capitulation. Maybe we should have gone out clubbing instead. Sure this was the test when the press got on a couple of our players for going to the casino on the second night, including Allan Lamb, who was captaining in the absence of Graham Gooch. Again, a nice way to compare that era’s cricket journos and today’s. Or maybe it’s the players now. I am going to use two 24th Novembers for this one, but with a common link. Two days ago I used the “On This Day” to highlight the debuts of two all-time greats. Today I use it to highlight the debut of one of my all-time favourite batsmen, Sir Richard Benjamin Richardson. In the early days of overseas test coverage, watching some of Richie’s innings took my breath away, especially an amazing 182 against Australia at Guyana. I always loved the big floppy sun hat, the backlift, the drive, the cut, the hook. Richie was flamboyant. He had the look. While not quite the highest of the high in terms of a career, in his pomp he was unstoppable. Except in England where he never really hit the heights. On this day in 1983, Richie took the field at the Wankhede Stadium in Mumbai for the first time as a West Indies test player. He didn’t get to bat until the 27th (rest day and a long Indian first innings), whereupon he made 0 (2 balls), LBW to Shvilal Yadav (who I instinctively remember when hearing either Umesh or Jayant’s name – no there is no relation). He made 26 in the second innings, falling to Ravi Shastri, but hadn’t done enough to cement his name into the West Indies team. He was dropped from the next test for Roger Harper. Unbowed, and a couple of centuries at home later, we fast forward to 24 November 1984. 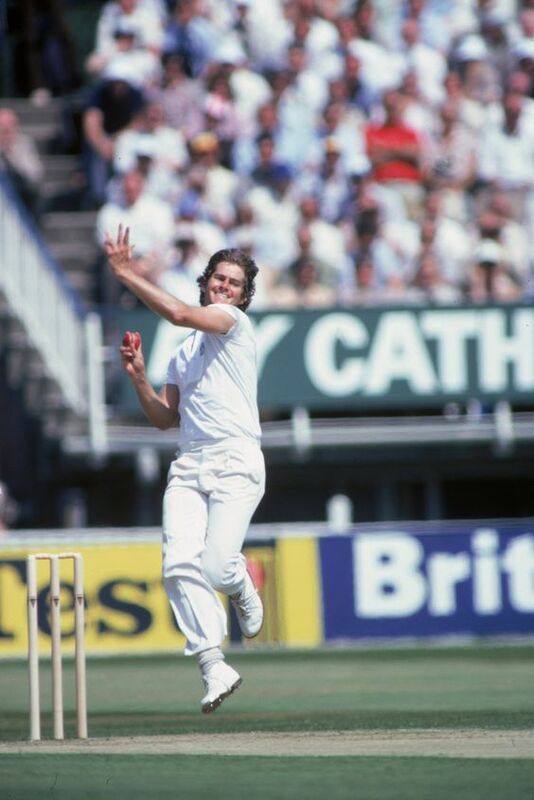 Having missed out on selection for all the England matches in the fateful summer of 1984 (again Harper getting the nod most of the time), Richie returned to the West Indies team to face Australia, and promptly made a duck in his only innings at Perth (match starting on the 9th). However, at Brisbane two weeks later, on the second day of the match (the 24th), Richardson announced himself to the Aussie domestic public with a century. The Aussie players knew him well enough – he’d made a 131 in Bridgetown and a 154 in his home test in Antigua – but now the fans got to see what he was all about. Well, that paints a picture. 24 November a debut for Richie, a first overseas ton for Richie. Much pleasure derived after that. As I said, one of Dmitri’s favourites! Today’s On This Day takes us back 42 years and again we are in India, at Bangalore. The great stars of the game always have to debut, you always have to have a first test, but it must be exceedingly rare that two of the all-time greats debuted on the same day. In the 1st Test of their tour of India, the West Indies awarded debuts to Cuthbert Gordon Greenidge and Isaac Vivian Alexander Richards. Their careers would span over 15 years, they would be integral to taking West Indies to the top of the world and keeping them there, and they would provide us with many memories. If a cricketer is ever as iconic as Viv in my watching days (keep your Sachins, Viv defined “aura”) then I can’t wait to see him. Gordon Greenidge seemed to miss out on the plaudits, but anyone who saw his 214 not out at Lord’s on the final day of the match to win a famous victory in 1984 should have no doubt. He was the opener of his generation (along with Gavaskar, I suppose). Greenidge had the more auspicious Day 1. He made 93 before being run out. His dismissal brought Viv to the crease, who hit a boundary and then got out to Chandrasekhar (who would also get him in the second innings). Greenidge would make a century in his second innings to help set up a massive win for the West Indies by 267 runs. Opening the attack, Abid Ali and Solkar were quite unable to harness the pitch’s favours. Moreover, Greenidge who made 93 in his maiden Test innings, was twice let off before he had made 15. He and Kallicharran, who came together at 38, when Fredericks retired with a sprained ankle, put on 139 in just over even time. Even this partnership was ended with a run out and so it was not until the last hour of the day, when Richards holed out at mid-off, that India’s bowlers at last struck a blow. 22 November saw the introduction of two cricketing legends, two childhood behemoths, two massive influences on my cricket watching. I never got to see either in the flesh (though I did see Gordon at Dublin Airport when he was the coach of Bangladesh). I got to see plenty on TV, either county or international cricket. That day in Bangalore is one of the most significant in cricket lore. Two stars on the ascendant. As a postscript, also making his debut that day was Hemant Kanitkar for the home team. He would last just two matches, batting at three in his first innings and making 65, he followed it up with three low scores and was never seen at international level again. Poor Hemant died last year. Being an international cricketer should never mean you are a footnote, but I’m not sure I’d mind being a footnote to those two. For today’s look back in time, we travel back to 1984 and a successful England tour of India. In those days tours were of a much greater duration and England had undergone some pretty traumatic times already with the murder of the British Consul early on in the visit. On the field things did not start to well, and if couched in a modern day context (and do you know how hard it is for me to have 1984 not referred to as “modern day”) this result would have social media running wild. England were playing the India U-25 team in a warm-up game. The Indian team was captained by Ravi Shastri, had Kris Srikkanth opening, Manoj Prabhakar in the bowling ranks, and two players who would go on to impact the test scene but yet to have made their debuts. On the 18th Mohammad Azharuddin made 151 as the U-25s made a score of 392/6 declared in response to England’s first innings effort of 216. However the final day saw England collapse to 117 all out, with Laxman Sivaramakrishnan taking four middle order wickets and sending preparations into disarray in Ahmedabad. Sivarama would go on to dominate the 1st Test in Mumbai, but England would fight back strongly. Azharuddin would come into the team in the 3rd test and reel off centuries in all the tests he played in but England would win the series. You’d have got long odds on that on 19 November 1984. (Shout out to the blog’s hero who made 11 and 6 in this match).